Hi Everyone! It is Wednesday Postcard time, where we share a favorite image from one of the places we’ve been as a family. Consider it a digital post card, delivered directly to you. In the tradition of an old school snail mail post card, we keep the writing brief and to the point. Without further ado, let us begin. This post card comes from lush Kandy, Sri Lanka. It’s the first place we’ve taken our baby outside of the country he was born in. Everything is good with him so far, and he is totally content to be carried in the baby carrier. Kandy is humid, and although it is hot, it’s not the same level of heat we’ve gotten accustomed to living in the UAE! Today we went to an amazing botanical garden, and as we walked along the sidewalk afterward, we couldn’t help but stop and admire the flowers that an old woman was stringing together for sale. I have to admit that we are still a little shy about asking people for more information about things we’re unfamiliar with at this point, but we gathered the flowers would be sold to Buddhist temple goers. The lady was friendly and didn’t mind that Jenia wanted to take her picture. Jenia found her hands fascinating, and we thought they told an interesting story in and of themselves. Still, wouldn’t it be interesting to sit down with this woman and listen to her share some stories? Kandy is somewhere we would recommend to anyone planning to visit Sri Lanka. For a full write-up detailing our time in Sri Lanka, explaining much more about Kandy and why we liked it, and also including some nice tips on what to do and what not to do, click here. 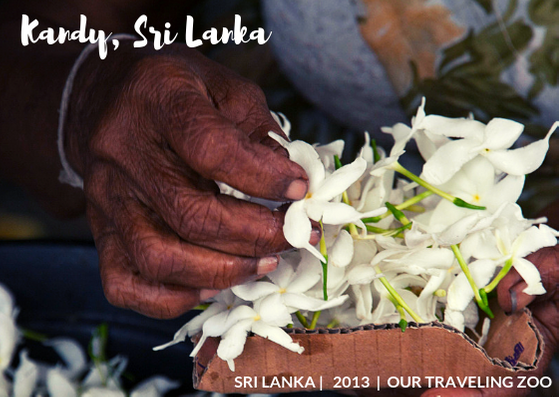 For another Wednesday Post Card from Sri Lanka, click here. Our Traveling Zoo is a nomadic family of four that enjoys working, living, and traveling overseas. Join us on our adventures!